Meet at Otani's: 8:30 a.m. - 9:30 a.m. Anniversary Party: 11:30 a.m. - 12:30 p.m.
2018 will mark 110 years that the Otani family has been in business in Oxnard and we want to celebrate with our past (and current) employees. We are constantly thanking our customers for keeping us in business all these years, but it would not have been possible without the support of all our team members! As a thank you for contributing to to our business legacy, we would love it if you walked with us in this year's Christmas Parade. · We will meet at Otani's between 8:30am and 9:30am and walk to the float together. There will be a small after party inside Otani's after the parade. Please let us know if you are able to join us (even if you are still a maybe). · There will be a float to ride on for anyone who cannot walk or would prefer to not walk. · Our goal is to thank all of our past (and current) employees for keeping us in business all these years. We are constantly thanking our customers, but would not be here without both customers AND employees. We want this to be a festive morning filled with friends old and new. If you know if someone that used to work here… please help us spread the word. The more the merrier! · There will be a casual get together after the parade that will be open to the public from 11:30 - 12:30. Food and drinks will be provided. 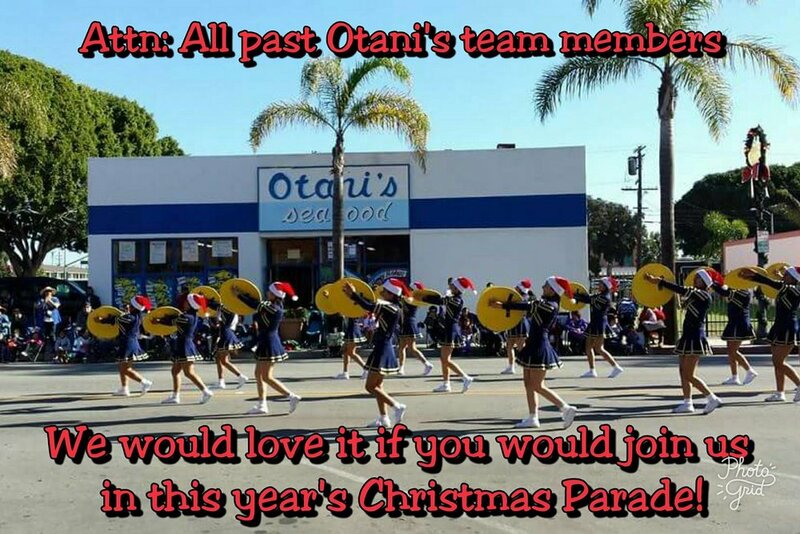 Please bring the family out to the Christmas Parade and join us after inside Otani's! *The current Otani’s was started in 1952 by great-grandpa, Izzy Otani... but his father, Toraichi Otani, started the first Otani’s business on the Boulevard in 1908! Nagasaki Kita High school (Nagasaki, Japan) will be returning to Ventura County for the 3rd year in a row! We are expecting about 60 students and are looking for interested host families. Hosting international exchange students is an unforgettable cultural experience that often leads to lifelong friendships! Students visiting from Nagasaki Kita High School are 15-17 years old, English-competent, fun, respectful, and excited about their first trip to America! Please email Tani at Tani@csoe.com for more information. "Team Otani's" team picture at 8:00 a.m.
We will be running on April 29th in the Aut2Run Charity Race to show our support for individuals and families living with Autism. We have had a Team Otani's the last 4 years and would love to have you join our team this year. Go to www.aut2run.org and click on "Register Now." Find the "5K Run/Walk" and click on "sign up." At the bottom it will have a "Race Group/Team" option. Click on the green "Create or Join Race Group/Team" button and scroll down till you find "Team Otani's" under the Aut2run 5K Teams.